Wow, it’s spring and our deck was a mess. Pollen, hundreds of fallen gum balls and, I admit, a few dead plants. Yuck. Is yours ready for some TLC too? Steve built our party-ready deck about 15 years ago with help from our friends. I designed it. I love that it is large enough for lots of plants, people and the grill. We do have some weird shade versus sun areas which means I need to plant accordingly. 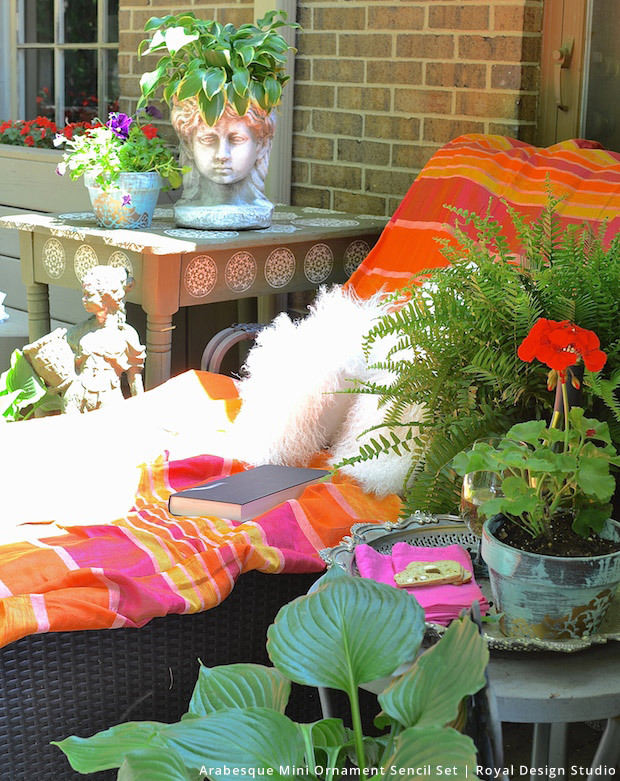 The right side of the chaise lounge is all shade with large hostas and an elephant ear in pots. 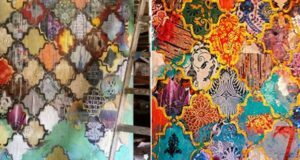 The left area is in the sun, where I had placed this old farm table that once briefly served as my worktable in my studio. 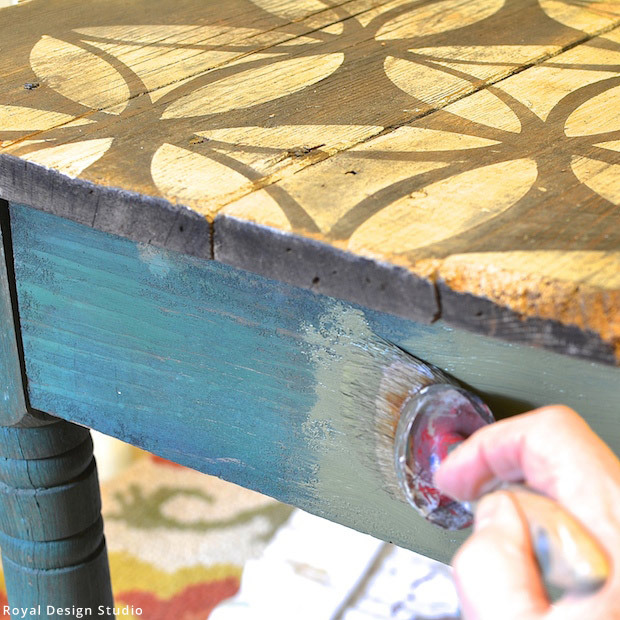 The table is so old that it has handmade nails, so I had no intention of giving it away. But the rough winter really took its toll on my rustic treasure. 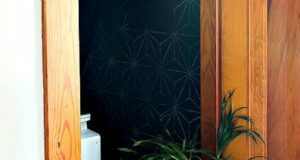 Royal Design Studio to the rescue. They are introducing the cutest furniture-size, mini versions of some favorite patterns. 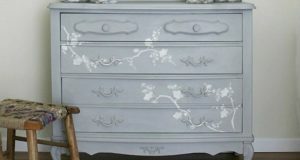 Even though my table is extremely worn, with some areas on the top completely missing, I wanted to dress it up a bit and preserve it for a few more years. 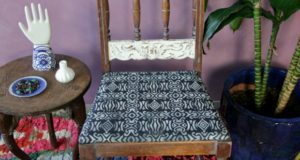 It’s perfect for potted plants and holding a glass of wine and a magazine. 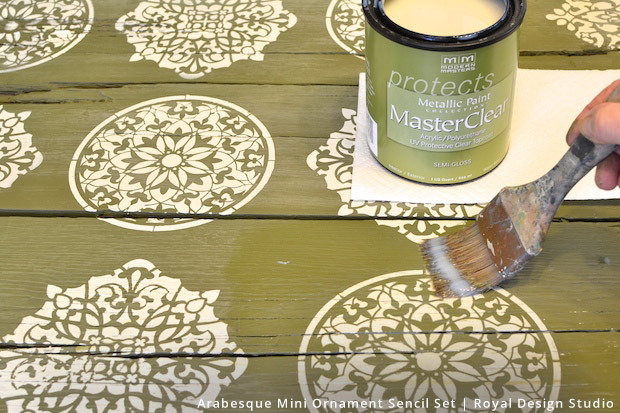 Brush on two coats of Olive Chalk Paint®. Let dry. 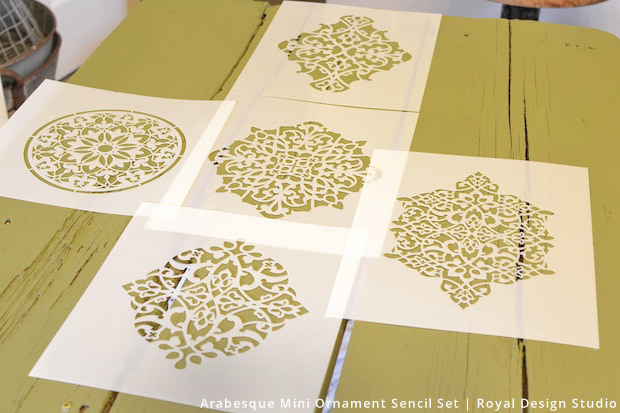 I worked out a design using only three patterns of the four Arabesque Mini Ornament Stencil Set to keep it simple. Find the center of the tabletop and mark it with a pencil. 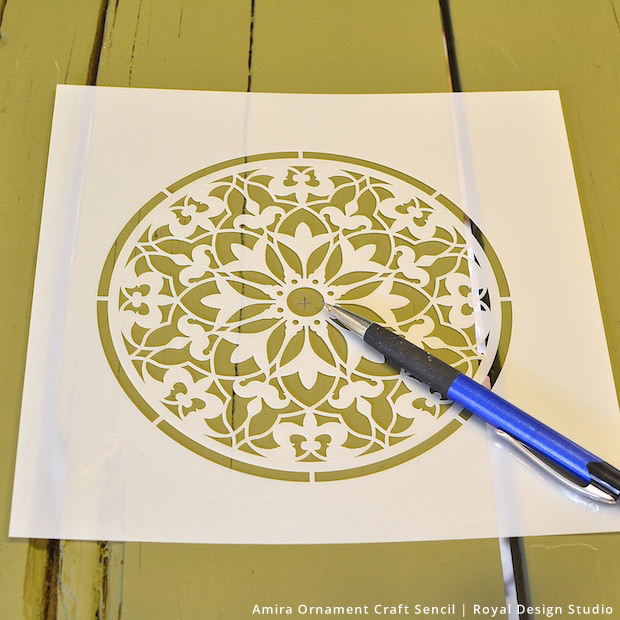 Stencil the center design. Then continue, using all three designs. I decided to use the tiniest circle on the skirt also. Lightly sand when dry, then wipe. 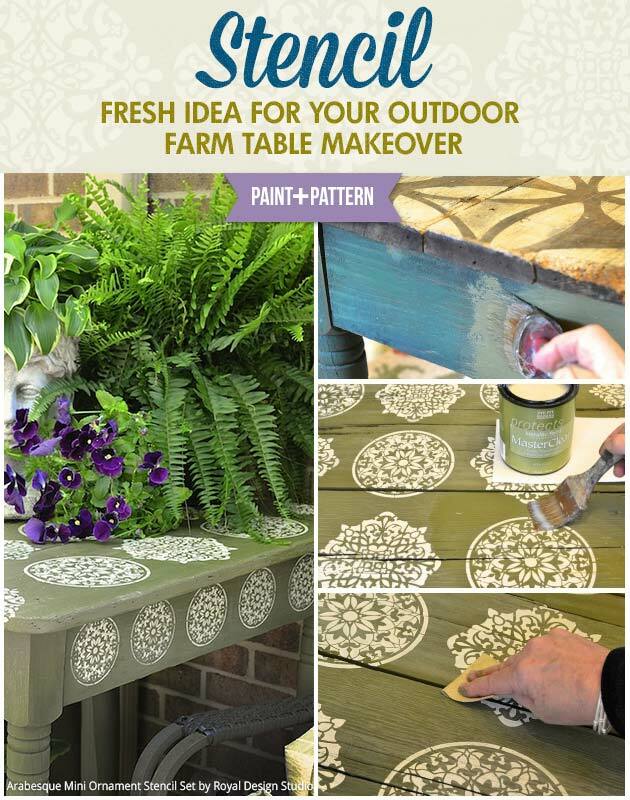 A great benefit of Chalk Paint® is that when used outdoors, it needs no sealer. However, this table could use some extra protection to keep it from further deteriorating. 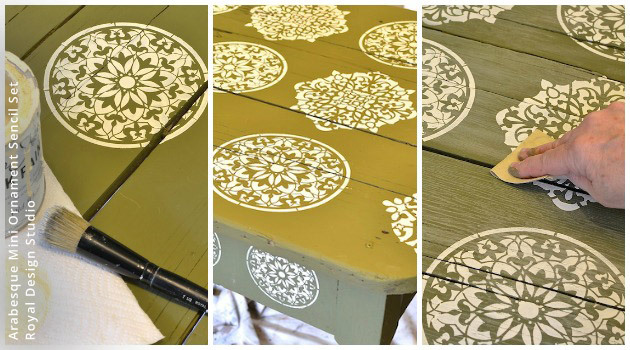 I painted on two coats of Modern Masters MasterClear that can be used indoors or outdoors. My little cozy corner is ready to enjoy now that I have added some of my treasured Moroccan wedding blankets. A book, a glass of wine, some cheese and I will be in heaven! Are you working on any fun outdoor projects this season? We want to see your creations. Email us at projects@royaldesignstudio.com or give us a shout out on Facebook or Instagram with #royaldesignstudio.